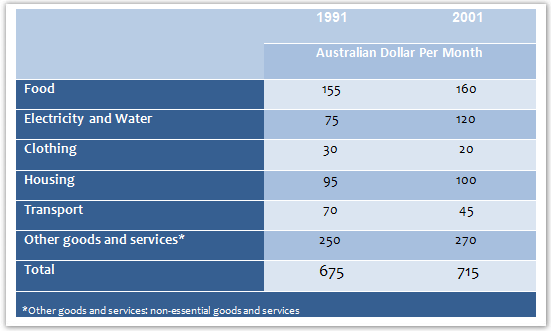 The given table demonstrates the expense on a monthly basis of a typical household in Australia in two years, 1991 and 2001. In general, there was witnessing an increasing amount of money expending on almost all sectors, except for clothing and transport. In particular, the expense of food was rising moderately from 155 dollars per month to 160 dollars per month. Likewise, the average Australian family had expended approximately 95 dollars monthly by 1991 on housing. This figure rose minimally to 100 dollars per month in 2001. In term of electricity and water, there was a nearly doubled in the quality of money which cost 120 dollars per month in 2001. I think your research is good enough. The information in the table is well-presented and the vocabulary is rich. Duc, you missed presenting a 4th paragraph in relation to other expenses presented in the chart. A task 1 essay always scores the highest when it presents a 4 paragraph analysis and report of the given information. It also helps you meet the minimum word count using only important words and information instead of filler words. 4 paragraphs means you did not miss any information for presentation in your report paraphrasing. No conclusion is required in an analysis essay. Your opening summary would have also been more complete if you outlined the given information as a listing summary in the opening paragraph. That is because the opening summary must create the outline of your discussion presentation for the reader. Likewise with the currency identification as it was clearly indicated in the graph. That clarity is required work regards to the currency as there are various dollar denominations available internationally. In this case, the table represents the Australian dollar currency a fact of great importance to the report. Overall, this is a well developed report that lacks certain information that would have helped to boost your general scoring considerations.